It's the season where everything should sparkle! 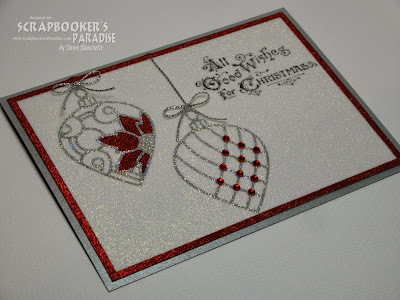 I have been playing with glitter again and put together a quick and easy tutorial for creating gorgeous projects using your favourite intricate wafer thin dies and microfine glitter. You can find my tutorial over on the Scrapbooker's Paradise inspiration blog here, as well as a detailed list of supplies used to make this card. This is stunning Dawn. such a gorgeous sparkly design and I love the touches of red. Beautiful glittery design Dawn, it is so pretty.